• Folds in Half • Push Button Release Clip • Push Button Zero Reset • Kick Down Side Stand • Deb.. 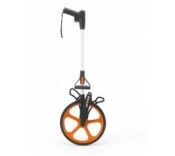 Features: Robust Measuring Wheel Trigger Brake in Handle Heavy Duty Shaft Folds in Half ..
Rotosure Measuring Wheel Carry Bag. This bag accomodates either the 1000 or RD1000 models. ..